rodgersantiques.co.uk » British Toy Companies : Gaiety Toys – Castle Art Products Ltd.
Home > General Discussion	> British Toy Companies : Gaiety Toys – Castle Art Products Ltd.
Amongst my husband things I came across an engine in a white box with Gaiety models,electric scale model locos “00″ gauge. on one end side it says: Electric 0-6-2,pannier tank loco,british railways 46917. He did have other train sets but this one seems tobe alone. 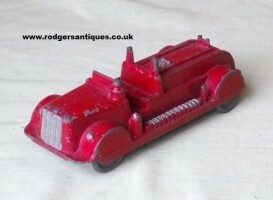 Could you please let me know if it’s a collectable engine and when was it made . Thank you very much. Hello Phyllis, your Gaiety loco certainly is collectable. As far as I am aware the 0-6-2 pannier tank loco British Rail running no. 46917 was produced as either a 2 or 3 rail operational model although originally also a static scale model for your layout. Motorised they sold for around the £3.00 mark, nowadays with the box (depending on condition of box/model, working or not etc) I would have thought around £30 + level. As for when it was produced ? best guess would be in the early 1950′s say around 1952/3 time but not 100% on that. Best I can do I’m afraid, David. No problem Phyllis, glad to be of help. Thanks for the info. appreciated. Any chance of a pic or two for the site ? Hi Derek, Morgan chromed three wheelers usually sell at auction for around the £35-£40 mark in good condition – so not a fortune but they are pretty common. 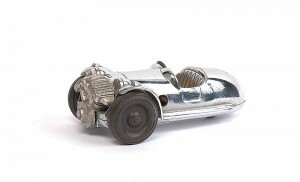 Hi, I have a 3-wheeled Morgan Gaiety by Castle art models – do you know what size key I need for the clockwork motor or is there any other toy’s key I could use? Hi there Graham, unlike most mechanical toys of the the 1940′s / 50′s produced by the likes of Chad Valley or Triang to name but two, Gaiety toys did not produce a key stamped with their name. Or I might be safer saying that I have never come across one ! One reason for this was that quite often the clockwork motors were a ‘bought -in’ item. Consequently you will find that one key will fit many different models from several different manufacturers. I think you will find that any ‘standard’ clockwork key will operate your model. I usually carry around a triang Minic key for this purpose and consider myself unlucky if it doesn’t fit ! However a friend of mine .. yes I do have one .. bought from a watch/clock repairers a multi-purpose key having four different size apertures coming off a central boss. 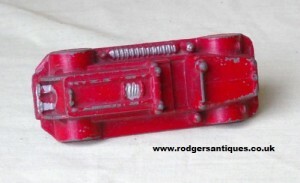 (No doubt there is a technical name for this type of key but I don’t know it !). Hope that is an adequate answer to your question, cheers David. John, if you can send a picture through I’m happy to post it and if I am unable to help I’m sure there will be someone out there who can. Seeking steering wheel for Gaiety Morgan Threewheeler..
John, I personally can’t help you out John as I’ve no Gaiety models for parts but if anyone out there can help please drop me a line. 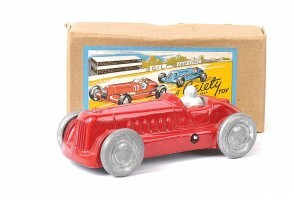 Hi I have a Gaiety model car that I am looking to sell. Do you buy items? Hello there Mel, sorry I personally don’t buy items offered through this site but if anyone is interested if you message me I will put you in touch with Mel. 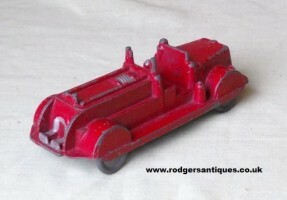 Hi there Jens, the Gaiety Toys Morgan, like the rest of the cars from this company, were produced with or without a clockwork motor. To be fair almost all of the Morgan models I have come across have been fitted with a mechanical drive and on that basis I would suggest that finding one without a motor fitted would be more of a bonus. Cars without a motor fitted originally would not have been produced with a keyhole in the side of the bodywork. Hi there Steve, sorry to be a while getting back to you on this one. Thanks for the offer but the Gaiety Toys three part train carried little value in original condition and even less, as most things are, when repainted. 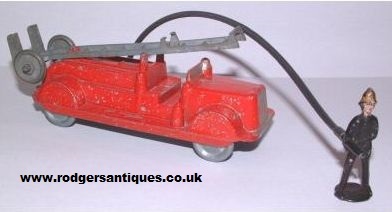 Pity really as these old toys were once loved by young boys but sadly have little value now. Can I make a suggestion, I spent some time last year as a volunteer at my local museum and did a display featuring toys which I would have played with as a boy. Without blowing my own trumpet too loudly it went down a treat with our visitors, so why not see if someone like that can make use of it, just a thought. All the best and keep on trawling those fairs, might bump into you one day, David.